Here in the US, arctic weather has elbowed in. Time for hot soup! 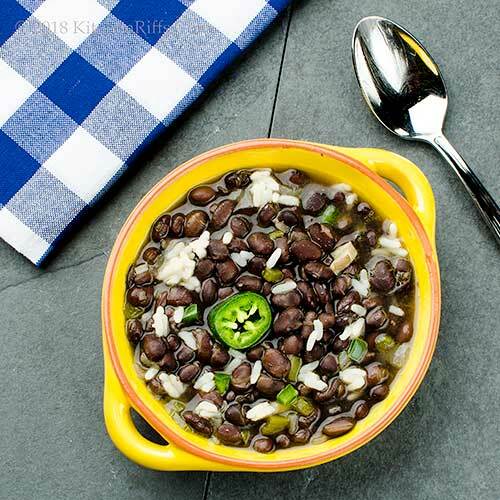 This Cuban-style black bean soup is particularly tasty and nutritious. And you can make a vegan version, so no one gets left out in the cold. There are hundreds of recipes for black-bean soup. Cuban-style recipes tend to use green bell pepper as an ingredient. They also finish with a bit of vinegar, which adds crispness and acidity. We use chicken stock in this recipe, but it’s easy to substitute water or vegetable stock for a vegan version. Or if you want a different meat-take, try ham stock. 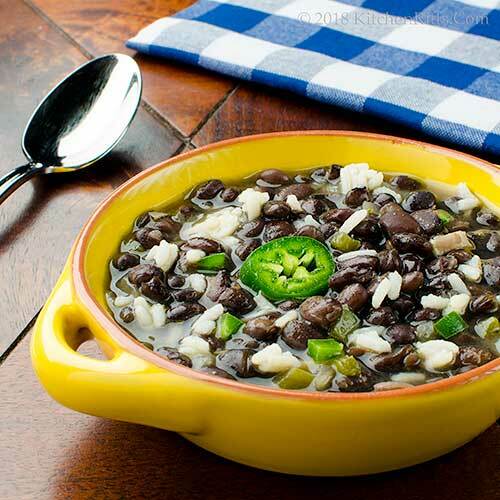 We use dried black beans for this soup, which need to be soaked – preferably overnight. (But see the Notes if you prefer to use canned beans). Once the beans are soaked, this recipe requires about 20 minutes of prep time, plus about 1½ hours cooking time (largely unattended). This recipe yields a big batch – at least 10 servings (depending on how much liquid you add). Leftovers freeze well. The night before you want to make the soup, soak the beans: Sort through the black beans to remove any dirt or grit. Place the beans in a bowl and cover them with cold water by at least 3 inches. Allow the beans to sit overnight. When ready to make the soup, drain the beans and add them to a 4-quart cooking pot. Add 6 cups of stock or water. Bring the beans to a simmer, then set a timer for 45 minutes. Meanwhile, peel the onion and chop it into dice of about ½ inch. Set aside. Wash the bell pepper, core it, and chop it into dice of about ½ inch. Set aside. Wash the jalapeño peppers and cut them lengthwise. Use a teaspoon to scoop out the ribs and seeds (careful – the oil on these is hot, so avoid touching your eyes). Cut the jalapeño peppers into fine dice and set aside. Then wash your hands with soap and water to remove the hot oil from your skin. Peel the garlic and cut it into thin slices or mince it finely. Set aside. Place the oil in a frying pan and heat it. When hot (it’ll shimmer), add the chopped onion, bell pepper, and jalapeño pepper. Add salt to taste. Cook until the onion is translucent and soft (5 to 8 minutes). Add the chopped garlic, and cook for an additional minute or two. Set the onion mixture aside until the 45-minute timer goes off (from Step 2). When it does, scrape the onion mixture into the cooking pot with the black beans. Add the cumin, coriander, and oregano. Add more water or stock if needed. Set a timer for another 45 minutes. After the soup has been cooking for a few minutes, taste it and add more salt if necessary. If you’re using the optional rice garnish, start cooking the rice now (cook according to package directions; set aside if it’s finished before the soup). When the second 45-minute timer goes off (from Step 8), test the black beans for doneness. They should be soft. If not, cook until they are. Right before serving, add the cooked rice (if using) to the cooking pot. Add a tablespoon of vinegar and stir it in. Taste the soup, then add another tablespoon of vinegar if necessary. Ladle the soup into serving bowls, adding a slice of jalapeño pepper to each bowl as garnish if you wish. We usually put a bottle of hot sauce (such as Tabasco) on the table for those who want to add more heat to their soup. Want to use canned beans instead of dried? Use three 15-ounce cans. Drain the beans into a large colander, then rinse them to remove the gunk they’re stored in. Sauté the onions, peppers, and garlic as directed in Step 7. Then add the onion mixture to a large cooking pot, along with the canned beans and 6 (or more) cups of liquid. Cook for 45 minutes. The amount of liquid we call for makes a reasonably thick soup (if you’re adding the optional rice). For a thinner soup, add more stock or water. Black beans go well with ham, so we sometimes use ham stock rather than chicken when we make this soup. If we happen to have leftover ham on hand, we might cube up a cup or two and add it to the soup. You could also cook the beans with a ham hock. Remove the ham hock from the cooking pot at the end of cooking. Cut off the meat (and dice it), then return the meat to the pot. We sometimes garnish this soup with diced hard-boiled eggs, red onions, or scallions. Crispy bacon bits make a nice garnish too, as does a dollop of sour cream. We use kosher salt in cooking. It has larger flakes than regular table salt, so it’s less salty by volume. If using regular table salt, start with about half of what we suggest. But always season to your taste, not ours. “Yup, we could free arroz in this weather,” I said. “Too bad we can’t fly down to old Havana for a mojito in the sun,” said Mrs K R.
“Are you going full Fidel here?” asked Mrs K R.
“Or Desi Arnaz,” said Mrs K R.
That's quite similar to the way I make black bean soup, though I'm afraid I find it tastier if a ham bone or smoked pork hocks got into the mix. I like to puree some of the beans for a thicker background, and garnish with sour cream too. As many bean soups as you love making John I will bet you would love one of those newfangled pressure cookers. They're not a magic pot and I don't cook everything in them like some people try to do but for a couple of things, and beans are one of them, they are a nice alternative to make quick work of legumes. Almost mid January in Colorado and we've had a week of sunshine and 60 degree temps and honestly I don't love winter but I'm sort of ready for it because I do love soups and this one looks fantastic! Hi Mae, this soup is probably made with a ham bone or pork hocks more often than not. And it's good that way! But the flavor of the beans really dominates (in a good way) in this version. :-) Thanks for the comment. Hi Barb, I keep thinking I should get a pressure cooker or Instant Pot. And probably will one of these days. But soaking beans isn't any trouble -- assuming I remember to do it! :-) Didn't realize you were having such warm weather, although we're having a few warm days right now -- probably getting your weather. It'll be cold again in a few days, though. Thanks for the comment. Hi John, were still hoping for winter weather here in AZ, but maybe I wouldnt be saying that if we ever experienced really cold weater, lol. Your black bean soup looks fabulous, love all the spice that you added. Hi Cheri, it's been cold enough here that we've had to cut our daily walks short on a few days (we do that when it gets below 10 F; sometimes 20, if it's windy). Although after a walk like that, soup sure tastes good! :-) Thanks for the comment. Freezing cold, -39C here this past Sat (but tomorrow they say +6C ???). Love black beans and loving hot soups right now! Never heard of a Cuban style soup before so happy for this discovery. I have to make a Cuban recipe soon for a challenge, thanks for the inspiration. Hi Evelyne, this is good stuff! Definitely worth a try. Looking forward to what you're going to make. :-) Thanks for the comment. I'm pretty much dying of happiness that it's going to be in the 50s here tomorrow, but then it's back to the deep freeze. Time for more soup! Love that you added vinegar. It's amazing how soup needs just a touch of acid. Hi Agness, it's good! You'll like. :-) Thanks for the comment. Hi Laura, that hit of acid really adds a lot! We've got close to 60 today and tomorrow, and more really cold weather. :-( Thanks for the comment. A soup like this is just right for me trying to shed some extra pounds. Unsuccessfully thus far! I have to tell you John, I just love your dialogue with Ms. Kitchen Riff. Hi Gerlinde, good thing about this soup is a little goes a long way. :-) Thanks for the comment. I adore all things legumes and beans, but have never had a cuban bean soup...it surely looks very delicious and I like that you have made this from the freshly homemade beans instead of canned one. Oh, I love black beans so I know this soup would be great! I just made navy bean soup yesterday, wish I would've seen this first! I agree with Mrs Riffs, "fly to old Havana for a mojito in the sun." Hi Angie, black beans, in particular, seem better when you use dried beans rather than canned. At least we think so! Thanks for the comment. Hi Pam, we haven't seen a lot of sun yet this year. Lots of soup, though. :-) Thanks for the comment. Nothing like a bowl of beans to warm you up when it's cold outside. Great choice! 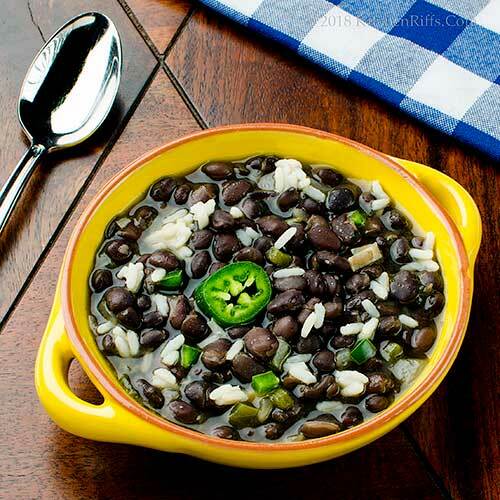 Love them black beans and this is such a great recipe. Have never added vinegar to a pot of black beans, but I would think it would perk that bowl of beans right up. I'll be giving that a try next time. Thanks John! Stay warm. We're having a relative warm winter in the 50's and 60 while the rest of the national is freezing. Strange weather! Hi MJ, that vinegar trick is SO good! Definitely worth trying -- bet you'll like it. :-) Thanks for the comment. We're having a brief reprieve with the weather as I'm sure you are, too. But snow will be coming this weekend and your soup would hit the spot! I'd throw in a ham bone, too. Hi Liz, a ham bone would be good in this! Thanks for the comment. Well, I guess you could fly down to Havana, you're not too far away, no? Yum, with all those beans in the recipe, I'd definitely be tootin' high with this one! Hi Fran, :-) We've never been to Cuba -- would love to go one of these days. And have soup, of course! Thanks for the comment. Hi Susan, we sometimes puree some of the beans when we make this soup (we just poke a stick blender into the pot before we add the rice, and zap the beans a few times). The ham sounds like a terrific idea, as does the sherry vinegar. Sorry about your weather, but this soup will cheer you up. :-) Thanks for the comment. Hi Dahn, we usually use lemon juice too, but the vinegar adds terrific flavor. :-) Thanks for the comment. Howdy John, this soup sounds so tasty , I have my beans soaking , I like to keep a pot of soup on the back burner when it's cold for the kids . It's cold down here in Louisiana , would you believe south Louisiana go snow , we have been below freezing , that's unusual . Hi Nee, wow, snow there really is unusual! You definitely need soup. :-) So good to "see" you again! Thanks for the comment. I love a good bean soup! This looks really good. Comforting soups are just great this time of the year and I love beans so this is right up my alley! LOL about "you can make a vegan version so nobody gets left out in the cold". This soup sounds perfect for these cold winter days - love it! I think black beans are my favourite beans so I know I'd love this soup! You're right John, there are so many recipes for Black Bean Soup but I love the Cuban flavors in your version. The splash of vinegar sounds fantastic! Hi Peachy, we can never resist bean soup, either. :-) Thanks for the comment. Hi Miriam, I think we all need a bowl of warm when it's cold out! Thanks for the comment. Hi Jessie, :-) This really is a great soup -- it's become one of our favorites. Thanks for the comment. Hi Caroline, black beans have terrific flavor, don't they? Love them! Thanks for the comment. Hi Tricia, the vinegar really makes the dish. Interesting how such a small thing has such an oversize effect. Thanks for the comment. Love bean soups and stews as well. I love to use dried beans and soak them overnight, it is not hard at all and I like the freshness of it more than the canned ones, although canned ones are more convenient in many cases. Very good recipe John. Hi Amira, we do use canned beans, but really prefer dried. I often will make a big batch of beans, then freeze them in small containers so I'll always have some on hand (just need to thaw; if using them in soup, just add them frozen!). Thanks for the comment. I have been thinking about black bean soup too and yours looks scrumptious. I watched an old Emeril video last week with him making the soup. He garnished his with chopped hard boiled egg and finely diced red onion. Interesting. Hi Rocquie, good to hear from you again! The most interesting garnish I've see for this soup is sliced bananas (I believe Jacque Pepin sometimes does it that way). Thanks for the comment. Hi Deb, you'll like this. So will your Instant Pot. :-) Thanks for the comment. Hi Lea Ann, vinegar is such a nice finish to so many dishes! Love it also. :-) Thanks for the comment. I love black bean soup but have never made it. This looks great and perfect for this nutty weather we've been experiencing. Hi Vicki, you need to make black bean soup! If not this recipe, another -- it's SO GOOD! Thanks for the comment. Hi Greg, black beans take so well to many different flavorings, don't they? Thanks for the comment. John, I thought *I* was the only person left in the world without an Instant Pot! Call me stuck in my ways, but I'm just not convinced it will do anything I can't do with my slow cooker and Le Creuset pots. I'm a huge black bean soup fan (well, technically, I'm regular-sized), and this looks like a really good one. Must try it. Hi Jean, I'm intrigued by the pressure cooker part of the Instant Pot, but really not sure how much I'd use it. Still keep thinking about it! Well, sometimes. :-) Thanks for the comment. Hi Emma, the vegetarian version is good. 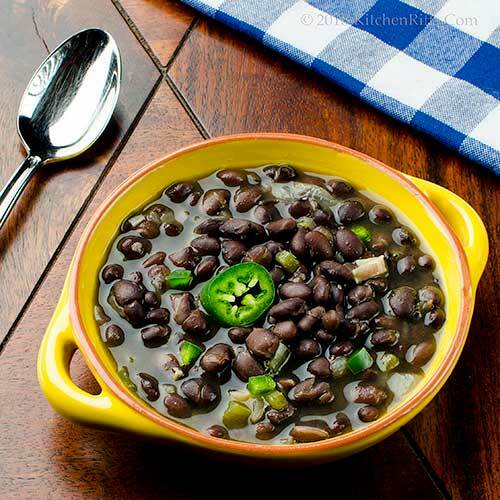 Black beans have so much flavor, you have a terrific soup using water instead of stock. Good stuff. :-) Thanks for the comment. This sounds so cozy for the chilly weather right now! I'd love a giant bowl! Hi Kelsie, it's really cold here again today, so we need to make another batch! :-) Thanks for the comment. I think I need to see this soup up close. Do you think you could send some over to the house! Hi Jeff, alas, all gone. :-) I need to make another batch -- it's cold again! Thanks for the comment. Now, this is what I want seconds of on a rainy winter night. Hi Carolyn, gotta have seconds of this! Is it even legal not to? :-) Thanks for the comment. Hi Judy, that vinegar is almost like magic. :-) Thanks for the comment. Beautiful! I got a Cuban recipe from a friend years ago, and it's finished with sherry. Interesting, huh?!! Hi Mimi, the sherry sounds like a wonderful idea! I've had soups finished with sherry before -- they're good. Bet it'd taste excellent in this (instead of the vinegar). Thanks for the comment. I love black beans, so I would love this soup. Great soup to keep the cold away. Yummy! Hi Dawn, this is a wonderful cold weather soup! Bought some more black beans today so I can make more soup. :-) Thanks for the comment. Delicious bowl of comfort soup. So is the vinegar for a little punch of flavor or other reason? Hi Bobbi, the vinegar is there for flavor, although there are some potential health reasons for including it. Thanks for the comment. This looks good, John. I made some black beans with your charro bean method last week and it was so good. Adding some bacon and bacon fat adds so much. I didn't have lard. If I wanted to make this recipe non vegetarian and use bacon fat and some bacon, would that work out all right, do you think? Change of subject, I am getting some ingredients together to try out some of your cocktails. Looking forward to those too! Thanks again! Hi Marion, bacon fat and bacon would be wonderful in this! Bacon and smoked pork are always wonderful with beans. Enjoy your cocktails! And thanks for the comment. Hi Marta, we all do. :-) Thanks for the comment. I love any kind of salad and this just looks like something I would love. Hi Peachy, good stuff, huh? :-) Thanks for the comment. Hi John, we love black beans and I know we would love the flavors in this soup. As you suggested, I bet ham stock would be great in this! Hi Marcelle, this will help you with your unusual cold/snowy weather in Texas. :D Thanks for the comment.